Gunmen barged inside the house of police inspector Mohammad Ashraf Dar and opened fire at him, killing him instantly. Earlier in the day, two policemen were shot dead in separate attacks at Kulgam and Pulwama. A police inspector was shot dead by terrorists at his residence in south Kashmir's Pulwama district this evening. He is the third policeman to be killed by terrorists in Jammu and Kashmir on Eid today. A search operation has been launched by the police. Fayaz Ahmad Shah, an under training police constable, was shot when he was returning home after offering Eid prayers in Kulgam, one of the worst terrorism-hit districts of south Kashmir. Mr Shah, 34, was working with the Jammu and Kashmir Police as a Special Police Officer and had been given an out-of-turn promotion and selected as a constable. He was undergoing training at Talwara in Jammu region and had come home. Terrorists fired bullets at him from close range near his house. He died on the spot. 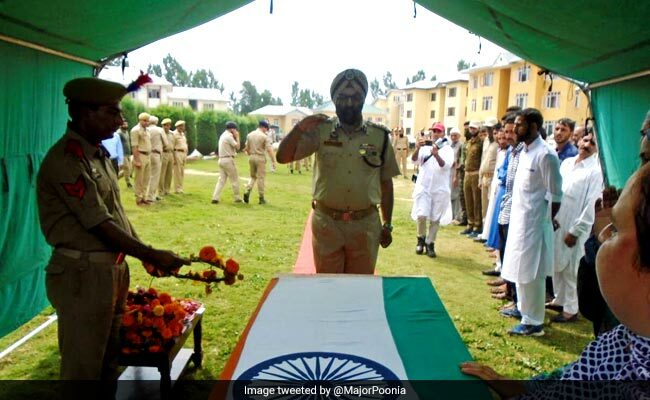 A wreath laying ceremony was held at district police lines Kulgam where officers led by Senior Superintendent of Police Harmeet Singh paid floral tributes to the police official. Another Special Police Officer identified as Mohammad Yaqoob Shah was shot at Pulwama district. He was declared brought dead at the hospital.